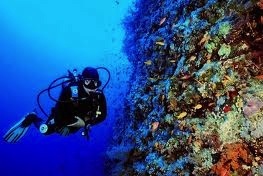 Plongez dans le grand bleu! In 1961, the famous oceanographer Jacques Yves Cousteau came to Cozumel with his crew on the Calypso to film a documentary. With the first airing of that film, Cozumel has consistently been on the top of many diving lists among diver’s destinations. It is quite normal to see vast coral heads, brilliant sponges, hundreds of tropical fish, rich ecosystems and steep walls that sink into the abyss. Tunnels and caves twist through the reef, providing a rich environment for many species, including some not found anywhere else on earth. 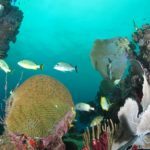 Cozumel is world-renown to be part of the second largest barrier reef system in the world and is considered some of the best wall diving in the world. 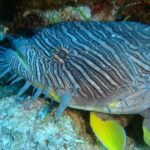 While diving in Cozumel, the average visibility is more than 130 feet or 40 meters and vertical drop offs to deep blue abyss is what Cozumel diving is famous for. 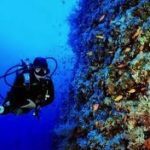 When diving in Cozumel there is over 15 world famous wall dives like Palancar, Santa Rosa, Colombia, San Francisco, Punta Sur, Maracaibo, Yucab, Cordona, and the list goes on. Large sponges and beautiful corals are what make Cozumel a definite must-see for any certified diver! Daily tour from 8 AM to 3 PM. DIve the second largest barrier reef system in the world, considered come of the best wall diving with an average visibility of over 130ft (40 meters). Round-trip transportation from our dive center to the ferry pier. Bottled water, juices and fruits on the boat. Dive the Mayan Cenotes, all different and special, with an Open Water Diver certification, it is possible to dive in these incredible caverns. Discover the thrill of wreck diving with wrecks in Playa del Carmen, Puerto Morelos and Cozumel. Depart from Playa del Carmen to explore the most colorful dive sites in the world’s second largest coral reef.